On 'The Never Ending Way of ORWarriOR,' Israeli metal band Orphaned Land dug deep into the recesses of history. The album has an exotic feel, thanks to the band's use of atypical, medieval instruments. "We use traditional acoustic instruments from ancient cultures and the lore of the different nations," guitarist Yossi Sa'Aaron Sassi told Noisecreep. "We have ancient songs we use, which are Jewish." That includes 400-year-old Yemenite Jewish songs and 1,000-year-old songs, which the band modernizes by re-arranging and layering. Sassi said, "We take an ancient poem and layer it with different arrangement from the rhythm section and the strings. We take a Yemenite poem from hundreds or thousands of years ago and add Western, metallic guitars or Greek guitars or by adding on arrangements or modern singing and vocals, so the end is a mix of cultures and sounds." This method of writing is an intricate endeavor and a labor of love, and more of a challenging task than, say, sitting in a room and banging out a riff. "Sometimes, we work like two weeks just on the diction, working on how to pronounce it, if it's Arabic or Yemenite, which is Old Hebrew," vocalist Kobi Farhi said. "It's very specific, and you have to challenge yourself to deliver it close to the way it was. It is deep, in terms of our investment, the way we compose or work on lyrics." 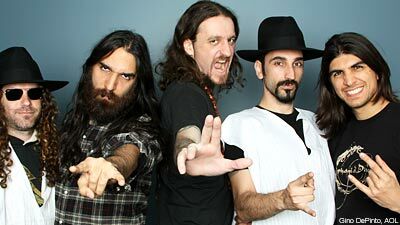 Clearly, Orphaned Land are an ambitious bunch in every aspect, and they like sticking their hands into the earth. For this, their first North American tour, they are driving themselves from New York City through Montreal and Toronto and then onto Chicago and Austin and aren't intimidated by it, thanks to modern luxuries like GPS and international driver's licenses. "We are new to the States, and it feels like we are virgins, in a way," Sassi said. "We want to experience it without intermediates!" And if they get pulled over on American roads for committing a traffic infraction? "We can just say, 'I am not local, I did not know you are not allowed to run people over,'" Sassi laughed! If you miss Orphaned Land on this spate of dates, don't fret. They have visas that don't expire for a year, and they want to come back for a full fall tour.